The SOUTHERN CROSS in 1965 – transiting the Panama Canal – on her regular world cruise service. Deck games on Shaw Savill. The Shaw Savill & Albion Company built two advanced one-class ocean liners for continuous around-the-world service. Voyages were approximately 75 days, from Southampton to Australia and New Zealand outward via South Africa and return via Panama or in reverse order. Southern Cross was a remarkable ship for her time, with significant innovative features. 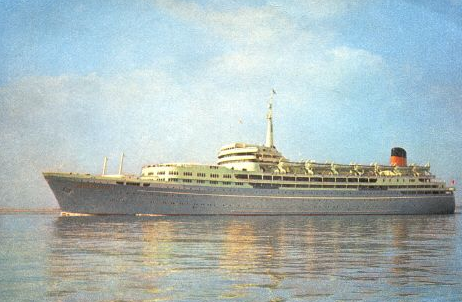 She was the first major liner with funnel and engines aft, which created substantial mid-ship passenger space, the first passenger ship that carried no cargo (except stores) and the first major modern liner with all tourist class accommodations. Shaw Savill Line The slightly larger Northern Star followed a few years later. She sailed eastbound, while her fleet-mate sailed westbound, with each ship completing four voyages per year. Both vessels had similar accommodation layouts. There were a large open Sports deck and Sun deck with outdoor pool. The Lounge deck offered a forward lounge, writing room, library, smoking room, two-deck cinema lounge and a tavern. 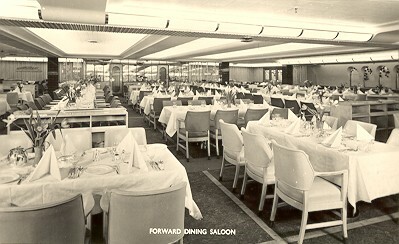 There were forward and aft restaurants and a proper wrap around Promenade deck. The Southern Cross was one of the most revolutionary ships ever built. She was the first aft engined passenger liner ever built and thus revolutionised ship design forever. Her example was then followed by other notable ships such as Holland America’s Rotterdam and P&O’s Canberra. Indeed many of today’s modern cruise ships follow her pioneering design principles. She was the first one class passenger liner ever built and did not carry cargo, and as a result she was the first true passenger only liner. She was also the first merchant ship launched by a reigning British monarch. After the Second World War ended, thousands in the United Kingdom were seeking to build a new life, and many decided to emigrate to New Zealand and Australia. At the time, to reach Australia and New Zealand, one would have to undertake sea journey. Shaw Savill was one of the leading British shipping lines at the time, and it was decided to build a new passenger ship. Shaw Savill’s dynamic chairman Mr. 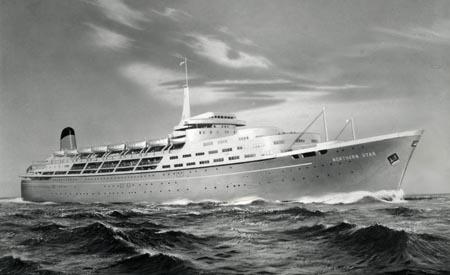 Basil Sanderson envisaged that this liner would be an all passenger ship, with holds for general cargo, and he implored ship designers to create a ship having her engines aft, providing passengers with additional deck space. As a result time would no longer have to be allowed for cargo handling, and the inevitable delays caused by pier availability and the persistent labour difficulties with stevedores and other unionized labour would be eliminated. The route to New Zealand would also be extended right around the world, carrying on across the Pacific via Fiji and Tahiti, to the American West Coast, then back to England via the Panama Canal and Atlantic Ocean. As she was purpose built to operate on the Australian, New Zealand service, Basil Sanderson thought that a name should be chosen befitting her destination. As a result Sanderson sent a letter to HM Queen Elizabeth II. In it he asked for her consent to launch the new liner, and also included three suggestions of names for the Queen to choose from. To the joy of Mr. Sanderson, the Queen replied that she would be happy to launch the ship. As for the name, the Queen had chosen Southern Cross – the constellation of stars found on the national flags of both Australia and New Zealand. HM Queen Elizabeth II launched the Southern Cross on 17 August 1954. This was an historic event, as the Southern Cross was the first merchant ship to be launched by a reigning British monarch. However the launch did not go without problems. As on the launch day dark clouds were looming in the sky, literally as well as figuratively speaking. It was a dull grey dawn in Ulster, with drizzling rain that fell more heavily as the morning wore on. What made matters worse was that the weather was equally bad in Scotland, where the Queen was staying at Balmoral Castle at the time. She was supposed to fly from Dyce to Aldergrove, fourteen miles from the yards of Harland & Wolff, arriving in good time at the ceremony which was scheduled for 1.15 pm. But the poor weather conditions lead to the Queen’s flight being delayed and Basil Sanderson was informed that she would probably arrive as much as 30 minutes late. This was terrible news. The blocks that had held the ship in position had been knocked away in preparation for the launch, and it would not be safe to delay it for more than half an hour. If the Queen could not arrive on time, the ship would simply have to be launched without her. Fortunately, Sanderson was not the only one who was aware of the precarious situation. When the Queen left Aldergrove by car, she was fifteen minutes behind schedule. But the police cleared the road to the shipyard, and the Queen instructed her driver to exceed the speed limits as the party raced through the streets of Belfast to make it there on time. Fortunately, their efforts were not in vain. Having regained the lost fifteen minutes during the speedy drive, the Queen arrived just on time, accompanied by ‘God Save the Queen’ played by the Royal Enniskillen Fusilisers as she stepped out of the car. 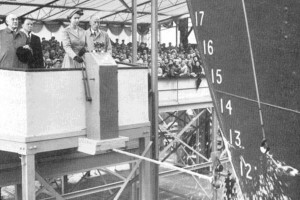 Words of Her Majesty Queen Elizabeth II at the Launch Ceremony, 17th August 1954. Before sending the vessel down the slipway into the water, the Queen spoke the traditional words. She then swung the bottle with accuracy, smashing it across the bow, and the mountain of steel began moving. Sliding into her rightful element to the cheers of the gathered crowd and whistles from nearby boats, the great hulk was soon brought to a halt and moved to her fitting-out berth where she would be completed. The Southern Cross was born. 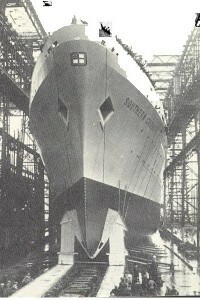 A few moths later, the fitting-out had been completed, and the ship was ready to go through her acceptance sea trials. 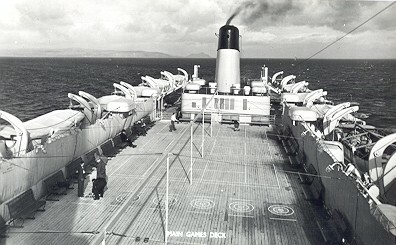 These were performed perfectly satisfactory off the Isle of Arran, with the ship achieving a maximum speed of 21 knots over the measured mile. And so, Shaw, Savill & Albion Line was happy to take delivery of the Southern Cross on the 23rd February 1955. Her debut on the run to Australia and New Zealand was still one month away, and so this time was put to good use with a few so-called shakedown cruises, to familiarise the crew with their new ship. 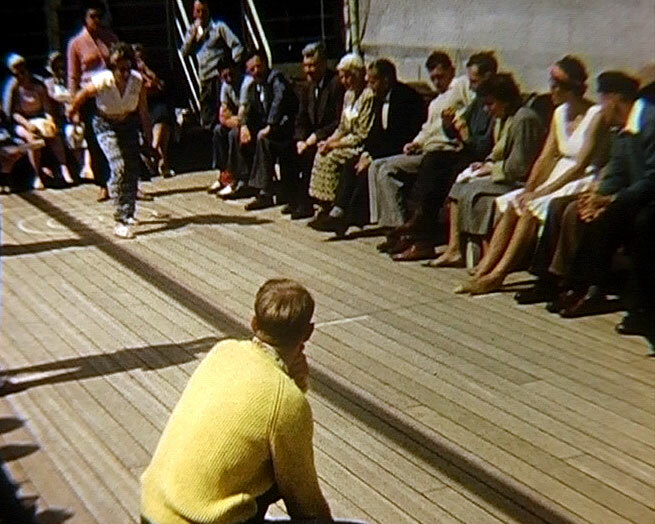 The Southern Cross sailed on her maiden voyage in round the world service (following a series of shakedown cruises) from Southampton on the 29th March 1955. Each year she made four 76 day voyages from Southampton to Las Palmas, Cape Town, Durban, Fremantle, Melbourne, Sydney, Auckland, Wellington, Fiji, Tahiti, the Panama Canal, Curacao, Trinidad and back to Southampton. She was fitted with stabilizers, was fully air-conditioned, had considerable uninterrupted open-air deck spaces, indoor and outdoor pools, a two deck high cinema, various public rooms (two of which extended the full width of the ship) and twin restaurants. She proved to be a very profitable ship for nearly fifteen years. Subsequently, in 1962 the 24,733-ton Northern Star entered service. Built by Vickers-Armstrong Ltd, she was a slightly larger ship of the Southern Cross’s basic design. This, if anything, was proof of the success of Basil Sanderson’s original vision. 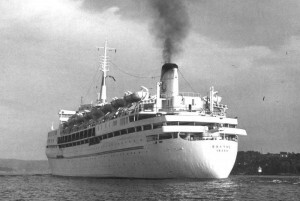 After the introduction of the larger but similar Northern Star in 1962, Southern Cross sailed westward from Southampton via Panama, while her fleetmate assumed the eastbound route. With this, Shaw, Savill & Albion Line really lived up to their reputation of being a company that brought Britons to Australia, and returning with Australians on holiday. In 1968 she was reregistered at 18,313 GRT. As passenger loads rapidly declined, due to the impact of the Boeing 747 and jet travel on their round the world voyages, Shaw Savill decided that the Southern Cross would undertake short cruise programs between her world voyages. In May 1970, she was extensively overhauled and refurbished making her suitable for cruise duties. 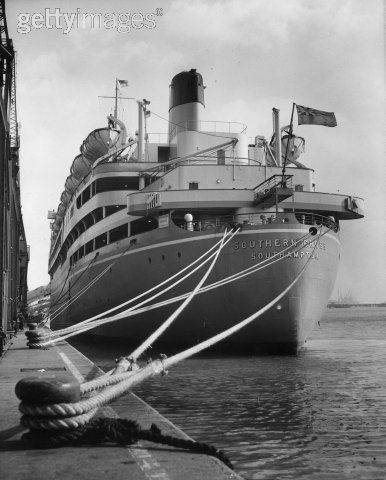 She first cruised out of Liverpool and Southampton for several months, after which she sailed for Sydney, and commenced cruising the South Pacific. After returning to Southampton, in May 1971, she cruised for another two and a half months. However, most cruises suffered from low loadings and proved to be unprofitable. She departed Southampton in August 1971 for her last voyage around the world, returning to Southampton in November. 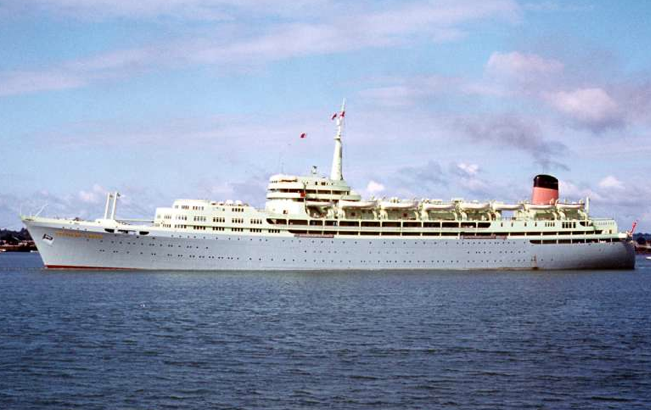 With only limited success, Shaw Savill opted to replace her with the Ocean Monarch (formerly known as Canadian Pacific’s 1957-built Empress of England) which, along with the mechanically plagued Northern Star lasted only a few years before the company closed its doors and both ships were sent to a premature end at Taiwanese breakers in 1975. Thus ended the story of Shaw Savill Line and its liner service to Australia and New Zealand. So the Southern Cross, after arriving back in Southampton after her final round the world voyage in November 1971, was laid up. In April 1972 she was relocated to the River Fal where she was berthed astern of Cunard’s Carmania, ex Saxonia, and Franconia, ex Ivernia. 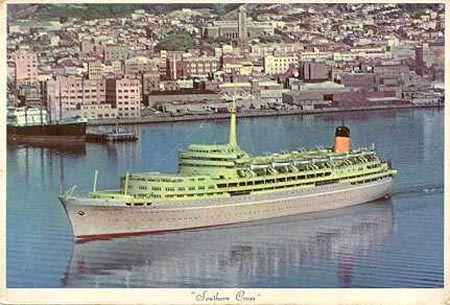 There Southern Cross remained on the market until January 1973, when a buyer was found. In January 1973, Southern Cross was sold for half a million UK pounds to, Cia de Vap Cerulea SA, Ithaka for Ulysses Cruise Line. She departed the UK in March with her bow revealing her new name, Calypso. She headed for Piraeus where she received a lengthy refit being converted for her new role as a full time cruise ship. Ulysses Cruises spent US$10 million to complete the comprehensive refit. With the SOLAS (Safety Of Life At Sea) regulations being in affect, all her fine wood paneling had to be stripped for fire safety reasons, which was replaced with fireproof plastics and chrome. This proved to be a massive task that took almost two years to complete. 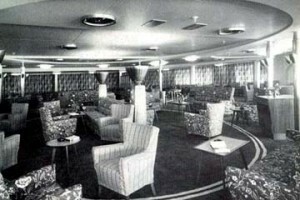 When Calypso’s refit was finally complete, her décor had become somewhat bland, even though, a minimalist color scheme was used in public areas. All cabins and suites were redecorated, and fitted with private facilities throughout. 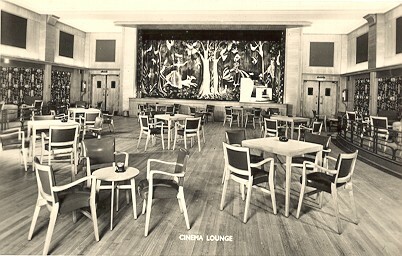 The layout of the public rooms remained as built, only the magnificent indoor pool, was removed and replaced by a Disco. Upon completion, she was classified as being 16,500 GRT, accommodating 950 passengers. 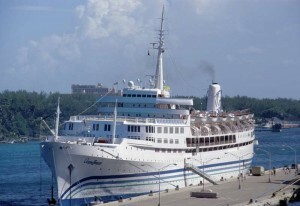 Calypso commenced her full-time cruise duties April 1975, cruising mostly throughout the Mediterranean. During 1978, she headed for South America where she operated a short cruise season, returning to Piraeus February 1979. Then on 16 December that year, she departed Greece for Miami, from where she operated seven night cruises around the Caribbean. Then one year later, having been renamed Calypso I, she transited the Panama Canal and commenced cruising from Los Angeles and San Francisco, including a season of seven-night cruises to Alaska, concluded in September. On September 29, 1980, Calypso was sold to the Western Cruise Line, a subsidiary of Eastern Steamship Lines Inc of Panama. 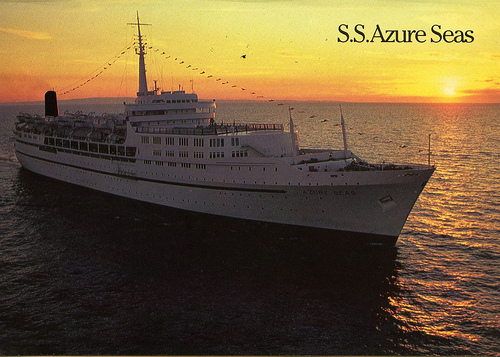 Western Cruise Line / Eastern Steamship Lines Inc, part of the Gotaas-Larsen Group of Shipping companies, renamed the ship Azure Seas. She departed on her first cruise for the new company in November, commencing cruises from Los Angeles to Ensenada Mexico. SO successful did she prove to be, she continued cruising to Mexico for until 1986, when Sundance Cruises, and Eastern and Western Cruise Lines amalgamated, forming a new company, Admiral Cruises. Thereafter, the Azure Seas continued her short Mexico circuits, which saw her popularity grow, and she became known as the “Party Ship.” Later she returned to Ft Lauderdale and commenced cruise duties to the Bahamas for the five years. In 1991, Royal Caribbean Cruise Lines acquired Admiral Cruises who had no need for the Azure Seas being old tonnage. She was sold to Dolphin Cruise Line who was looking to add a third ship to their popular fleet consisting of Dolphin IV, and Sea Breeze I. The Azure Seas was now renamed ss Ocean Breeze, and was given extensive renovations. Now registered in Aruba, ss Ocean Breeze commenced seven night cruises around the Southern Caribbean and the Panama Canal. In 1996, she was relocated for cruising out of Florida, and New York. Late in 1997, Dolphin, Seawind and Premier Cruises amalgamated. ss Ocean Breeze continued her cruising duties under her new banner, but received bright new livery, featuring a dark blue hull, topped with a gold ribbon, and a dark blue funnel. She looked very impressive indeed, better than at any time during her past 54 years in service. Ocean Breeze resumed her Panama Canal and Caribbean cruise service until early 1999. In early 1999 the Ramada-owned Imperial Majesty Cruise Lines was created. IMC chartered the OceanBreeze from Premier Cruises and retained her livery, but replaced the Premier funnel logo with a white crown. Under Premier, her aft flanks had the name “Premier Cruises” painted on it. 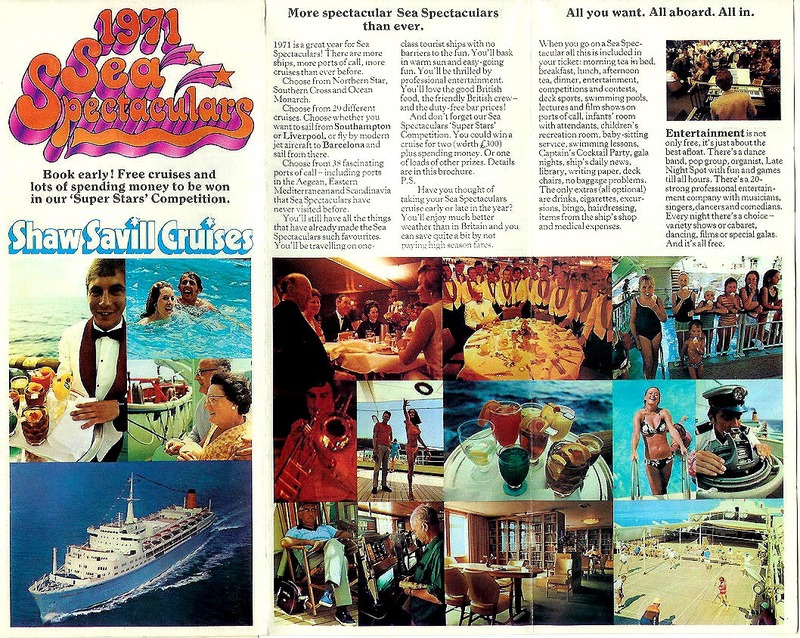 This was replaced with “Imperial Majesty.” The IMC product was to operate year-round two night cruises from Ft. Lauderdale to Nassau in the Bahamas. The Ocean Breeze departed on her inaugural cruise from Pt. Everglades on January 11, 1999. Due to the immense success of her short and affordable cruises, combined with excellent service, entertainment, and cuisine, Imperial Majesty decided to purchase the Ocean Breeze outright on May 20, 2000. In September, ss Ocean Breeze received a complete refurbishment, which in the words of the IMC President, Mr. Arthur Pollack, would see her “restored to her original splendour, making her a truly classic ship, with a modern and tropical ambiance.” It is said that the ss Ocean Breeze returned to her Ft. Lauderdale-Bahamas service with the well wishes of HRH Queen Elizabeth II, and she had sent her regrets for not being able to re-christen the ship. ss Ocean Breeze continued her successful two night cruise duties to the Bahamas, until June 2003. After four years of faithful service, IMC made a sudden announcement on June 3, 2003. Ocean Breeze was going to be replaced by another classic cruise ship, the Regal Empress (ex Caribe I, Olympia). The Ocean Breeze was not sold because of deterioration or mechanical failures, for she was in excellent condition, and described as “ready for trade.” Ocean Breeze was also in possession of a SOLAS (Safety Of Life At Sea) certificate, which is valid to 2010. Ocean Breeze departed on her last cruise in June 2003, returning to Ft. Lauderdale three days later. The Regal Empress, departed for her first two-night cruise to Nassau on 24 June. After arriving back in Fort Lauderdale after her final cruise the Ocean Breeze was laid up and put up for sale. Sadly in 2003 despite an Australian preservation campaign to save her, she was sold to scrap merchants and on the 25th August 2003 she departed the Grand Bahama shipyard where she had been laid up and headed out to sea on her final voyage. On the 3rd September 2003 she arrived at Gibraltar and took on bunkers. On the 12th September 2003 she passed through the Suez Canal. On the 13th October 2003 reports from Chittagong said that she had encountered a severe storm, and was taking on a list and much water as she neared the breakers beach in Bangladesh. Originally headed for Alang, the venerable liner continued onward to Bangladesh where a higher scrapping price was tendered. However she did finally arrive at Chittagong in Bangladesh and was soon beached ready for scrapping. Over the next few months she was gradually dismantled and by May 2004 there was nothing left of this once revolutionary ship. However she had one last moment of fame when she was filmed on the beach by the BBC’s renowned Michael Palin (formerly of Monty Python fame but now a renowned travel programme presenter) as part of a piece on the ship breakers of Bangladesh as part of his Himalaya TV series. 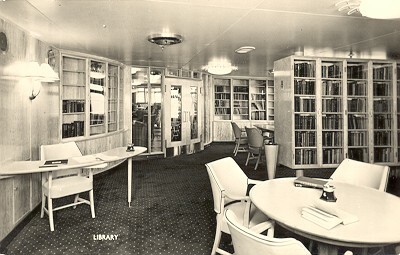 Aboard the SOUTHERN CROSS… Games Deck, Cinema, Library and Dining Salon. Next: An Historical Look at Cunard Line’s RMS QUEEN ELIZABETH… The first in a line of QE liners.